Iberis is a one-year or perennial plant (and sometimes and a semi-bush). Now there are about 40 of its types of this plant. Iberis grows in mountains of Asia Minor, in Southern Europe, and also in the Ukraine and in Russia. This plant is obliged by the name to Spain: this country was called in the ancient time Iberia. 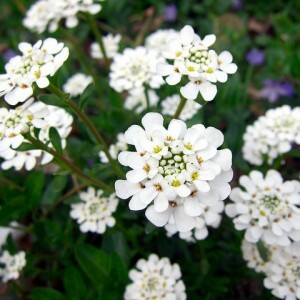 In the people also other names of Iberis are known: Iberiyka, Perechnik, Stennik. Though Iberis's inflorescences not strongly differ in uniqueness of forms and shades, but their improbable pleasant smell of various grades forces flower growers to land the whole plantations, besides during cultivation it isn't necessary to use any efforts. Iberis. Iberis perennial. Iberis cultivation.